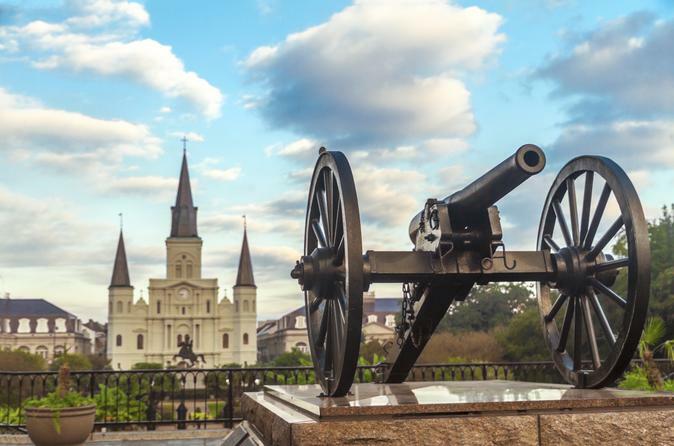 Trace centuries of history, culture, sights and sounds of the dynamic city of New Orleans on this 2.5-hour tour by mini-coach and on foot. Drive through the vibrant French Quarter, the beautiful Garden District and Jackson Square — a US National Historic Landmark — to see Creole townhouses, shotgun homes, historic mansions and the longest bridge in the world, the Lake Pontchartrain Causeway. Then hear tales of ghosts, voodoo and New Orleans' unique burial traditions on a walk at the legendary St Louis Cemetery No. 3. Choose from multiple tour times to suit your schedule. Board a mini-coach outside your New Orleans hotel and start your 2.5-hour tour with a drive to the French Quarter, where you’ll find some of the city’s most classic architecture and interesting history. Drive past Creole townhouses and shotgun homes, a highly popular style of Southern homes in the early 1860s. Peek into courtyards and pass by small shops selling herbs, candles, oils and amulets used in ancient voodoo traditions and rituals. A highlight of the French Quarter is Jackson Square, a stately park and US National Historic Landmark. Pass through the neighborhood of Tremé and the lovely Garden District, home to one of the country's best-preserved collections of Southern mansions. Here you’ll see the longest bridge in the world, the Lake Pontchartrain Causeway. Next, take a walking tour one of the city’s most haunted cemeteries, St Louis Cemetery No. 3, featuring above-ground tombs from the 18th and 19th centuries. Learn about the theories behind this unusual burial custom as you stroll the grounds, and hear stories about famous figures from New Orleans' past. At the end of your 2.5-hour tour, you'll be driven back to your hotel.